Have you ever had to bounce back from a serious injury? When an injury happens, your fitness routine can become severely limited or you may be unable to exercise entirely. This can make it feel impossible to get back to where you were before. Judy Roberts knows this firsthand. After a serious back injury that led to five surgeries, plates and screws implanted into her back, physical therapy, and a period of home healthcare, doctors said she’d never walk comfortably or stand straight again. On top of that, she'd be on pain medication for the rest of her life. At that point, Judy decided to visit O2 Fitness in Morrisville, N.C. to discuss her diagnosis. "I told them my problem and they referred me to Eric," she said. "At this point, my life began to change." 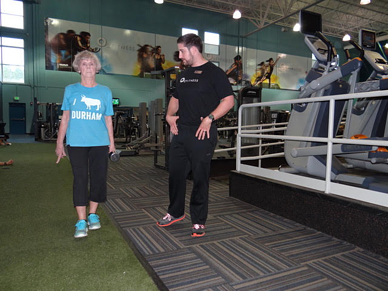 After just nine months of hard work with the help of Park Place Personal Trainer Eric Wilson, 74-year-old Judy began to walk and stand up straight. Now, three years later, she has made an incredible recovery beyond what her doctors believed she was capable of. "She has shown that the mind can do incredible things and help the body overcome what was originally thought to be impossible," said Eric, her personal trainer. "When I met Eric, my goal was to stand up straight and walk," she said. "Eric developed a plan for me and said he thought we could achieve 80% mobility. I was excited then, but I am more excited now." Judy can now walk 2 miles without stopping, perform 20 walking lunges at a time, deadlift a 30-pound bar, and hold a plank for 2 minutes. "Judy embodies what it means to consistently put in hard work and have the will to never give up no matter how bleak the circumstances, and proves that anyone can achieve these results if they have the proper mindset and methodology," Eric said. In a recent doctor visit, her blood work came back better than it has been in 5 years. Anytime she has a flare-up, she now has all the tools necessary to alleviate and manage the pain through daily exercises at home. "I'm sure it is due to the great plan Eric developed for me," she said. "His knowledge is overwhelming! He knows about all of the muscles in your body. When I ask questions or have doubts he always has the answer. With his help, I have gone from barely able to move, to 85% mobility; more than I ever dreamed was possible." 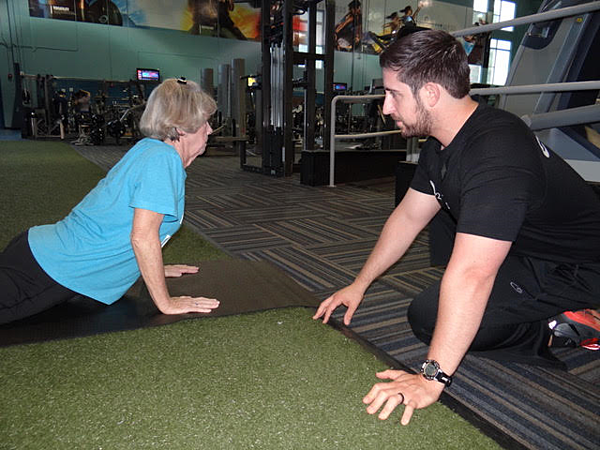 As for Eric, he's ecstatic to be able to come to work and help people like Judy make progress both inside and outside the walls of O2 Fitness. "For me, it is the greatest feeling in the world to help someone achieve their dreams and be able to see the smile on their face when they can move pain-free for the first time in years," he said. From barely standing straight to performing walking lunges across the gym, Judy has come a long way. Thanks to her truly life-changing experience with Eric's help, she's getting better and stronger every day. "Eric is such an inspiration in my life," Judy said. "He has made my life worth living!"